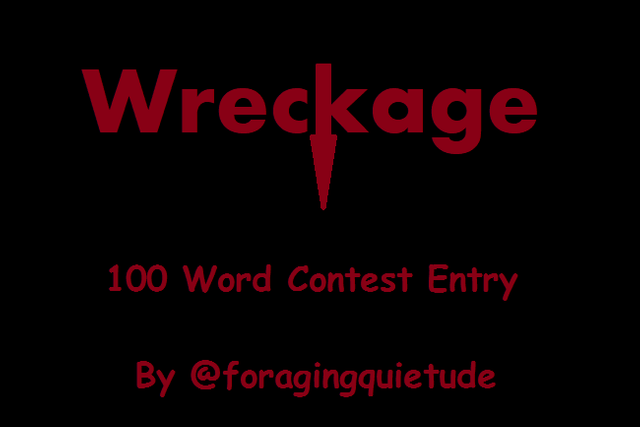 This is my entry for the 100 Word Contest hosted by TWB. You can find out more about it here. I open my eyes to see the windshield disintegrating and shattering into rays before me. I tense up as I hold onto the steering wheel, fighting the force gravity has pressed upon me. I come to a stop at the edge of a swollen stream and gas fumes fill my nostrils as I work the seatbelt to get free. My surroundings start to fade and I’m awakened by two hands that grip me hard, pulling me from the wreckage. Nice! You did a great job of setting a scene and creating a very suspenseful storyline, @foragingquietude. You also incorporated a great last line that adds a nice twist. I suggest one edit. I think you want to say "I'm awakened" in the fourth sentence. I can see why you would go with present tense, since your story is told in present tense, but "awakened" is correct. Ah yes. I agree it should be "awakened". I'll get that changed. Thanks @jayna! Love it. Great twist at the end. Thanks @purpledaisy57. This was my first attempt at micro fiction.